We often like to check in with other BASIS.ed schools to learn about what their students are up to. In the hustle and bustle of daily life here at BASIS Independent Brooklyn, it is only natural for our focus to be on the goings-on in our four walls and not what's going on with the the thousands of other BASIS.ed students around the country. ...but they're certainly making waves! 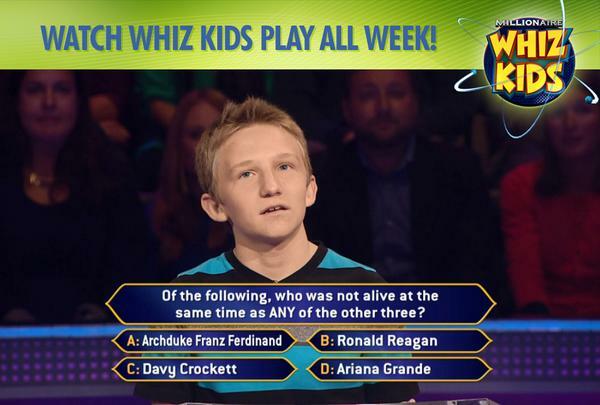 Back in November, Isaac Dabkowski of BASIS Oro Valley in Arizona flew to our neck of the woods to appear on Who Wants To Be A Millionaire Whiz Kids edition. What we love most about Isaac's story is not the $31,100 he walked away with or the fact that he has fantastic stage presense, but that he was confident enough in himself to go against what 72% of the audience was telling him was correct, really putting his knowledge of Orwell's 1984 to the test. Not to mention, leaning on another BASIS student to help him out! Stay tuned for more stories of BASIS Beyond Brooklyn.